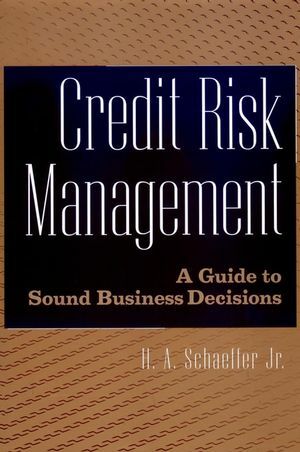 Complete with twelve chapter-length real-world case studies of problems typically encountered (with detailed solutions), Credit Risk Management offers practical, no-nonsense advice on how to minimize the risks-and maximize the benefits-to you and your company when you finally say "yes" to an applicant. H. A. SCHAEFFER Jr., CCE, CEW, is President of D&H Credit Services, Inc., a credit and financial customer service consulting firm to all sizes of manufacturers, wholesalers, government agencies, and credit organizations located in Port Washington, N.Y. He has served as a credit consultant for a number of midsize companies as well as Fortune 500 companies, including Bausch & Lomb and Mobil, Inc. He has taught credit courses for the American Management Association (AMA), the National Association of Credit Management (NACM), and Dun & Bradstreet. He has also taught customized courses for Fortune 500 companies and noncredit organizations. STEPS FOR A SOUND BUSINESS CREDIT DECISION. A Is for Analysis for Creative Credit Management. B Is for Building Essential Business Credit Information. C Is for Considering All Factors That Impact the Business Credit Decision. D Is for Decision (or Recommendation). Case Study 1: Sure Progress, Inc: Creative Alternatives to the Direct Extension of Credit. Case Study 2: International Exports, Inc: Creative Methods to Reestablish Open Account Credit with a Former Problem Customer. Case Study 3: Special Materials, Inc: Business Issues and Costs That Effect a Sound Business Credit Decision. Case Study 4: Fast Action Suppliers, Inc: Preserving a Company's Reputation That is Tarnished by a Customer's Slow Paying Practices. Case Study 5: True Delivery Seals, Inc: Minimizing Exposure to Loss Due to the Cancellation of a Distributor Contract. Case Study 6: First Choice Company, Inc: Dealing with a Last-Minute Credit Decision. Case Study 7: Perfect Image Suppliers, Inc: Addressing a Customer with an Overbearing Attitude. Case Study 8: Basic Needs, Inc: Considering Increased Credit Limits for Existing Customers. Case Study 9: Drugs "R" Us Products, Inc: Addressing a Customer's "Shady" Past. Case Study 10: Freezy Refrigerator Repair Co: Addressing the Problems with the Sale of a Service. Case Study 11: Terra Technology, Inc. The Risk of a Custom Order Sale. Case Study 12: Compania Swift, Inc. The Sale of Goods to Foreign Customers.